This article is about a title in the Peerage of England. For other uses, see Earl of Pembroke (disambiguation). The Earldom of Pembroke (Welsh: Iarllaeth Penfro) is a title in the Peerage of England that was first created in the 12th century by King Stephen of England. The title, which is associated with Pembroke, Pembrokeshire in West Wales, has been recreated ten times from its original inception. With each creation beginning with a new first Earl, the original seat of Pembroke Castle is no longer attached to the title. As of 2018[update], the current holder of the earldom is William Herbert, 18th Earl of Pembroke, which is the 10th creation of the title. For the past 400 years, his family's seat has been Wilton House, Wiltshire. Since 1605, the Earls of Pembroke have also held the title Earl of Montgomery. This was created for the younger son of Henry Herbert, 2nd Earl of Pembroke before he succeeded as the 4th Earl in 1630. The current Earls of Pembroke also carry the subsidiary titles: Baron Herbert of Cardiff, of Cardiff in the County of Glamorgan (1551), Baron Herbert of Shurland, of Shurland in the Isle of Sheppey in the County of Kent (1605), and Baron Herbert of Lea, of Lea in the County of Wilts (1861). All are in the Peerage of England except the Barony of Herbert of Lea, which is in the Peerage of the United Kingdom. On 1 September 1532, King Henry VIII created the original Marquessate of Pembroke for his future queen Anne Boleyn. This honour was in recognition of the king's great-uncle Jasper Tudor, who had been the Earl of Pembroke in the 15th century, and his own father, Henry VII who was born at Pembroke Castle in January 1457. The title of Earl of Pembroke has been held successively by several English families, the jurisdiction and dignity being originally attached to the county palatine of Pembrokeshire. The first creation dates from 1138, when the Earldom of Pembroke was conferred by King Stephen on Gilbert de Clare (died 1148), son of Gilbert Fitz-Richard, who possessed the Lordship of Strigul (Estrighoiel, in Domesday Book), the modern Chepstow. In the Battle of Lincoln (1141), the Earl fought on the side of King Stephen. After the king's defeat however, he joined the party of the Empress Matilda. Later he became reconciled to Stephen when he recovered his throne. The earl married Henry I's mistress, Isabel, daughter of Robert de Beaumont, Earl of Leicester. That being said, Arnulf de Montgomery was likely created Earl of Pembroke by William Rufus, decades before Gilbert de Clare. Arnulf himself was rewarded by the king with lordship of Pembroke upon his family's construction of Pembroke Castle in the late 11th century. Like his father, Richard Fitz Gilbert de Clare (commonly known as Strongbow) was a supporter of Stephen, King of England - the last Norman king of England. His opposition to the claims of the French House of Anjou alienated him from the affections of Henry II of England. As a result, on his father's death in 1148, it seems likely that the king refused to recognise Richard's claims to the earldom of Pembroke. His claim to the lesser lordship of Striguil does not seem to have been challenged. Being effectively disinherited by the king (for the first but not the last time in his life) and with mounting debts, Richard welcomed the opportunity to restore his fortunes that presented itself in 1168. In that year, he was chosen to lead a Norman expedition to Ireland in support of Diarmait Mac Murchada, the deposed King of Leinster. The Lord of Striguil crossed over in person in 1170, took both Waterford and Dublin, and was married to Diarmuid's daughter, Aoife MacMurrough, claiming the Kingship of Leinster after Diarmuid's death in 1171. Henry II, wary of his power, stripped Strongbow of his new holdings the same year and invaded Ireland himself in 1171, putting his people in power. Strongbow returned to favour and power in Ireland, in 1173 when he aided the King in his campaign against his rebelling sons. He died in 1176 after years of bitter struggle with Irish magnates. Strongbow died with male issue - Gilbert. However, Gilbert, being a minor, was not formally invested with either the earldom of Pembroke or of Striguil. It is unlikely that his father could have passed on title to Pembroke as he himself did not possess it. When Gilbert died in 1185, his sister Isabel de Clare became Countess of Pembroke in her own right (suo jure) until her death in 1220. In this way, she could be said to be the first successor to the earldom of Pembroke since her grandfather Gilbert, the first earl. By this reckoning, Isabel ought to be called the second countess, not the fourth countess of Pembroke. In any event, the title Earl was re-created for her husband as her consort, the famous Sir William Marshal, son of John the Marshal, by Sibylle, the sister of Patrick, Earl of Salisbury. In August 1189, at the age of 43, William Marshal, held by many to be the greatest knight in Christendom, was given the hand of Isabel de Clare, and, in 1199, was created the 1st Earl of Pembroke by King John. Although he had previously served Richard's father, Henry II, against Richard's rebellions, Richard confirmed the old King's licence for his marriage with the heiress of Strigul and Pembroke. He served Richard and John loyally, defending the latter against the French and English rebel barons in the First Barons' War. He was present at the signing of the Magna Carta in 1215. Upon John's death in 1216, the seventy-year-old Marshal was named Regent of the kingdom and protector of the young King, Henry III. He defeated the rebels and their French allies, and reissued the Magna Carta in order to secure the peace. He fell ill early in 1219, and died on 14 May at his manor of Caversham near Reading. He was succeeded in the regency by Hubert de Burgh, and in his Earldom by his five sons in succession. Marshal's eldest son, William Marshal (died 1231), 2nd Earl of Pembroke of this line, passed some years in warfare in Wales and Ireland, where he was justiciar from 1224 to 1226; he also served Henry III in France. His second wife was the King's sister, Eleanor, who later married Simon de Montfort, but he left no children. His brother Richard Marshal (died 1234), 3rd Earl, came to the fore as the leader of the baronial party, and chief antagonist of the foreign friends of Henry III. Fearing treachery, he refused to visit the King at Gloucester in August 1233, and Henry declared him a traitor. He crossed to Ireland, where Peter des Roches had instigated his enemies to attack him, and in April 1234, he was overpowered and wounded, and died a prisoner. His brother Gilbert (d. 1241), who became the 4th Earl, was a friend and ally of Richard, Earl of Cornwall. When another brother, Anselm, the 6th Earl, died in December 1245, the male descendants of the great Earl Marshal became extinct. The extensive family possessions were now divided among Anselm's five sisters and their descendants, the Earldom of Pembroke reverting to the Crown. The next holder of the lands of the Earldom of Pembroke was William de Valence, a younger son of Hugh de Lusignan, count of La Marche, by his marriage with Isabella of Angoulême, widow of the English King John. In 1247, William, along with two of his brothers, moved from France to England, where their half-brother, Henry III was King. The King married William to Joan de Munchensi (d. 1307), a granddaughter and heiress to the great William Marshal, 1st Earl of Pembroke. Valence was granted custody of the lands, and the title of Earl of Pembroke, giving him great wealth and power in his new land. As a result, he was unpopular, and was heavily involved in the Second Barons' War, supporting the King and Prince Edward against the rebels led by Simon de Montfort. 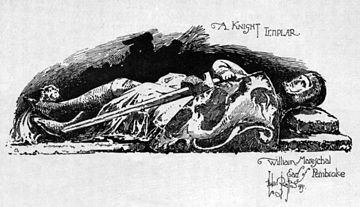 After the final defeat of the rebels at the Battle of Evesham in 1265, William continued to serve Henry III, and then Edward I, until his death in 1296. William's eldest surviving son, Aymer (c. 1265 – 1324), succeeded to his father's estates, but was not formally recognized as Earl of Pembroke until after the death of his mother Joan in 1307. He was appointed guardian of Scotland in 1306, but with the accession of Edward II to the throne and the consequent rise of Piers Gaveston to power, his influence declined. He became prominent among the discontented nobles, but in 1312, after the Earl of Warwick betrayed him by executing the captured Gaveston, he left the allied lords and joined the King. Valence was present at Bannockburn in 1314, and later helped King Edward defeat Thomas of Lancaster. However, by his death in 1324, he was again marginalized at court, and in financial trouble as well. His wife, Mary de Châtillon, a descendant of King Henry III, was the founder of Pembroke College, Cambridge. Lawrence, a great-grandson of William de Valence was created, or recognized as, Earl of Pembroke, having inherited (through the female line) a portion of the estates of the Valence Earls of Pembroke. His son John (died 1376) married Margaret, daughter of King Edward III, and on the death without issue of his grandson in 1389, the Earldom of Pembroke reverted again to the Crown. Humphrey, the fourth son of King Henry IV, was created Duke of Gloucester and Earl of Pembroke for life, these titles being subsequently made hereditary, with a reversion as regards the Earldom of Pembroke, in default of heirs to Humphrey, to William de la Pole, 1st Duke of Suffolk. On the death of Humphrey without legitimate issue in 1447, William de la Pole became Earl of Pembroke. He was beheaded in 1450 and his titles were forfeited. Sir Jasper Tudor was the half-brother of King Henry VI. Being a Lancastrian, his title was forfeited for 24 years during the predominance of the House of York. Following Jasper Tudor's attainder, Sir William Herbert, a zealous Yorkist, was raised to the peerage as Baron Herbert by Edward IV. Herbert took the Lancastrian Jasper Tudor prisoner during the civil war. For this service, he was created Earl of Pembroke in 1468. Perhaps mindful of its earlier Tudor holder, the second earl surrendered his title to Edward IV ten years after acceding and received, in lieu, the Earldom of Huntingdon. In 1479, Edward IV conferred the title on his son, Edward, Prince of Wales. When this prince succeeded to the throne as Edward V of England, the Earldom of Pembroke merged in the crown. Following the defeat of the House of York, the earldom (and kingdom) were restored to the Tudors with the accession of Henry VII. On 1 September 1532, a few months prior to her marriage to Henry VIII, Anne was granted the Marquesate of Pembroke; she was found guilty of treason and executed in May 1536, at which point the title became either forfeit or extinct at her death without male children. The title was next revived in favour of Sir William Herbert, whose father, Richard, was an illegitimate son of the 1st Earl of Pembroke of the house of Herbert. He had married Anne Parr, sister of Henry VIII's sixth wife, Catherine Parr, and was created Earl in 1551. The title has since been held by his descendants. Arms of the Earls of Pembroke (tenth creation). The heir apparent is the present holder's son Reginald Henry Michael Herbert, Lord Herbert (b. 2012). An executor of Henry VIII's will and the recipient of valuable grants of land, Herbert was a prominent and powerful personage during the reign of Edward VI, both the protector Somerset and his rival, John Dudley, afterwards Duke of Northumberland, angling for his support. He threw in his lot with Dudley, and after Somerset's fall obtained some of his lands in Wiltshire and a peerage. It has been asserted that he devised the scheme for settling the English crown on Lady Jane Grey; at all events he was one of her advisers during her short reign, but he declared for Mary when he saw that Lady Jane's cause was lost. By Mary and her friends, Pembroke's loyalty was at times suspected, but he was employed as governor of Calais, as president of Wales and in other ways. He was also to some extent in the confidence of Philip II of Spain. The Earl retained his place at court under Elizabeth until 1569, when he was suspected of favouring the projected marriage between Mary, Queen of Scots, and the Duke of Norfolk. Among the monastic lands granted to Herbert was the estate of Wilton, near Salisbury, still the residence of the Earls of Pembroke. His elder son Henry (c. 1534 – 1601), who succeeded as 2nd Earl, was president of Wales from 1586 until his death. He married in 1577 Mary Sidney, the famous Countess of Pembroke (c. 1561–1621), third daughter of Sir Henry Sidney and his wife Mary Dudley. Sir Philip Sidney to whom she was deeply attached through life, was her eldest brother. Sir Philip Sidney spent the summer of 1580 with her at Wilton, or at Ivychurch, a favourite retreat of hers in the neighbourhood. Here at her request he began the Countess of Pembroke's Arcadia, which was intended for her pleasure alone, not for publication. The two also worked at a metrical edition of the Psalms. When the great sorrow of her brother's death came upon her she made herself his literary executor, correcting the unauthorized editions of the Arcadia and of his poems, which appeared in 1590 and 1591. She also took under her patronage the poets who had looked to her brother for protection. Spenser dedicated his Ruines of Time to her, and refers to her as "Urania" in Colin Clout's come home againe; in Spenser's Astrophel she is "Clorinda". In 1599 Queen Elizabeth was her guest at Wilton, and the Countess composed for the occasion a pastoral dialogue in praise of Astraea. After her husband's death she lived chiefly in London at Crosby Hall, where she died. The Countess's other works include: A Discourse of Life and Death, translated from the French of Plessis du Mornay (1593), and Antoine (1592), a version of a tragedy of Robert Garnier. She is one of the handful of people whom certain scholars conjecture may have been the true author of the plays attributed to William Shakespeare. Robin Williams' book "Sweet Swan of Avon" published by Wilton Circle Press, USA, documents the Countess's fascinating life as well as those of her two sons (see below). William Herbert, 3rd Earl of Pembroke (1580–1630), eldest son of the 2nd Earl and his famous countess, was a conspicuous figure in the society of his time and at the court of James I. Several times he found himself opposed to the schemes of the Duke of Buckingham, and he was keenly interested in the colonization of America. He was Lord Chamberlain of the royal household from 1615 to 1625 and Lord Steward from 1626 to 1630. He was Chancellor of the University of Oxford in 1624 when Thomas Tesdale and Richard Wightwick refounded Broadgates Hall and named it Pembroke College in his honour. By some Shakespearian commentators Pembroke has been identified with the "Mr W. H." referred to as "the onlie begetter" of Shakespeare's sonnets in the dedication by Thomas Thorpe, the owner of the published manuscript, while his mistress, Mary Fitton, has been identified with the "dark lady" of the sonnets. In both cases the identification rests on very questionable evidence. He and his brother Philip (the second Herbert son who, for some profitable time, was the adored object of "bisexual" King James I's affections) are the "incomparable pair of brethren" to whom the First Folio of Shakespeare is inscribed. The Earl left no sons when he died in London on 10 April 1630. Clarendon gives a very eulogistic account of Pembroke, who appears, however, to have been a man of weak character and dissolute life. Gardiner describes him as the Hamlet of the English court. He had literary tastes and wrote poems; one of his closest friends was the poet Donne, and he was generous to Ben Jonson, Massinger and others. His brother, Philip Herbert, 4th Earl of Pembroke (1584–1650), was for some years the chief favourite of James I, owing this position to his comely person and his passion for hulking and for field sports generally. In 1605 King James I of England created him Earl of Montgomery and Baron Herbert of Shurland, and since 1630, when he succeeded to the Earldom of Pembroke, the head of the Herbert family has carried the double title of Earl of Pembroke and Montgomery. Although Philip's quarrelsome disposition often led him into trouble he did not forfeit the esteem of James I, who heaped lands and offices upon him, and he was also trusted by Charles I, who made him Lord Chamberlain in 1626 and frequently visited him at Wilton. He worked to bring about peace between the King and the Scots in 1639 and 1640, but when in the latter year the quarrel between Charles and the English parliament was renewed, he deserted the King who soon deprived him of his office of chamberlain. Trusted by the popular party, Pembroke was made governor of the Isle of Wight, and he was one of the representatives of the parliament on several occasions, notably during the negotiations at Uxbridge in 1645 and at Newport in 1648, and when the Scots surrendered Charles in 1647. From 1641 to 1643, and again from 1647 to 1650, he was chancellor of the university of Oxford; in 1648 he removed some of the heads of houses from their positions because they would not take the Solemn League and Covenant, and his foul language led to the remark that he was more fitted "by his eloquence in swearing to preside over Bedlam than a learned academy". In 1649, although a peer, he was elected and took his seat in the House of Commons as member for Berkshire, this "ascent downwards" calling forth many satirical writings from the royalist wits. The Earl was a great collector of pictures and had some taste for architecture. His eldest surviving son, Philip (1621–1669), became 5th Earl of Pembroke, and 2nd Earl of Montgomery; he was twice married, and was succeeded in turn by three of his sons, of whom Thomas, the 8th Earl (c. 1656–1733), was a person of note during the reigns of William III and Anne. From 1690 to 1692 he was first Lord of the Admiralty; then he served as Lord Privy Seal until 1699, being in 1697 the first plenipotentiary of Great Britain at the congress of Ryswick. On two occasions he was Lord High Admiral for a short period; he was also Lord President of the Council and Lord Lieutenant of Ireland, while he acted as one of the Lords Justices seven times; and he was President of the Royal Society in 1689–1690. His son Henry, the 9th Earl (c. 1693–1750), was a soldier, but was better known as the "architect Earl." He was largely responsible for the erection of Westminster Bridge. The title descended directly to Henry, 10th Earl (1734–1794), a soldier, who wrote "The Method of Breaking Horses" (1762); George Augustus, 11th Earl (1759–1827), an ambassador extraordinary to Vienna in 1807. Robert Henry, 12th Earl (1791–1862), died in France without issue and was buried in the Père Lachaise Cemetery in Paris. George Robert Charles, the 13th Earl (1850–1895), was a grandson of the 10th Earl and a son of Sidney Herbert, 1st Baron Herbert of Lea, whose second son Sidney (born 1853), after a career as a Member of Parliament, inherited all the family titles at his brother's death. His eldest son Reginald became 15th earl in March 1913. He was succeeded by his eldest son Sidney, 16th earl, who spent time in the service of the Duchy of Kent and served as trustee of the National Gallery. His son Henry Herbert, 17th Earl of Pembroke, who was often known simply as Henry Herbert, succeeded to the titles in 1969; he had a significant career as a documentarian and film director. As of 2018[update], the current earl is William Herbert, 18th Earl of Pembroke, who became earl of Pembroke and 15th of Montgomery on the death of his father in 2003. The city of Pembroke Pines, Florida, is thought to have been named after the Earl of Pembroke, an early landowner in Broward County. Pembroke, New Hampshire, was named after the ninth Earl by Governor Benning Wentworth. Pembroke, Kentucky, was not named for any of the earls of Pembroke as is sometimes claimed but for the character of Pembroke Somerset who appeared in the popular 1803 novel Thaddeus of Warsaw, which described the 1790s uprisings in Poland. There is an all-male dorm on the campus of Belmont University in Nashville, Tennessee, Pembroke Hall, that is named after this city, as an original Trustee of the building was from the city. The seventh Earl was twice involved in trials for murder: in 1677–78 and killing William Smeethe, a London Officer of the Watch, in 1680. ^ An Inventory of the Ancient Monuments in Glamorgan. Royal Commission on the Ancient and Historical Monuments of Wales. 1981. p. 355. Retrieved 11 July 2016. 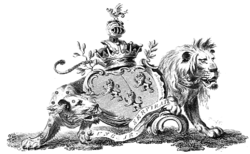 ^ a b c Debrett's Peerage of England, Scotland, and Ireland. Debrett's. 1840. p. 569. Retrieved 11 July 2016. ^ a b c d e f g h Chisholm 1911, p. 78. ^ a b c d e f g h i j k Chisholm 1911, p. 79. ^ Chisholm 1911, pp. 79-80. ^ a b c d e f Chisholm 1911, p. 80. ^ Fox-Davies, Arthur Charles, ed. (1902). Armorial Families: A directory of gentlemen of coat-armour, volume 1 (1970 ed.). Rutland, Vermont: Charles E Tuttle Company: Publishers. p. 1925. ISBN 978-0-7153-4766-9. ^ Rennick, Robert. Kentucky Place Names, p. 229. University Press of Kentucky (Lexington), 1987. Accessed 1 Aug 2013. ^ William Cobbett; David Jardine (1816). Cobbett's complete collection of state trials and proceedings for high treason: and other crimes and misdemeanor from the earliest period to the present time ... from the ninth year of the reign of King Henry, the Second, A.D.1163, to ... [George IV, A.D.1820]. R. Bagshaw. p. 619. Retrieved 23 July 2013. ^ Sir Richard Bulstrode (1897). ... The Bulstrode Papers: Volume I (1667-1675). private circulation. p. 269. Retrieved 23 July 2013. ^ James Thorne (1876). Handbook to the Environs of London: Alphabetically Arranged, Containing an Account of Every Town and Village, and of All Places of Interest, Within a Circle of Twenty Miles Round London. J. Murray. p. 627. Retrieved 23 July 2013. This article incorporates text from a publication now in the public domain: Chisholm, Hugh, ed. (1911). "Pembroke, Earls of" . Encyclopædia Britannica. 21 (11th ed.). Cambridge University Press. pp. 78–80. G. E. Cokayne, Complete Peerage, vol. vi. (London, 1895). W. Stubbs, Constitutional History, chs. xii. and xiv. (Oxford, 1896–1897). Pembroke Castle is a medieval castle in Pembroke, Pembrokeshire, Wales. The castle was the original family seat of the Earldom of Pembroke. A Grade I listed building since 1951, it underwent major restoration during the early 20th century. Earl Marshal is a hereditary royal officeholder and chivalric title under the sovereign of the United Kingdom used in England. He is the eighth of the Great Officers of State in the United Kingdom, ranking beneath the Lord High Constable and above the Lord High Admiral. 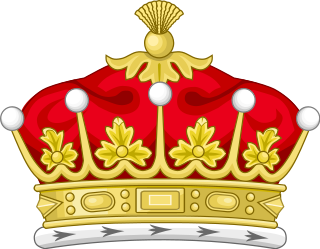 Earl of Warwick is one of the most prestigious titles in the peerages of the United Kingdom. 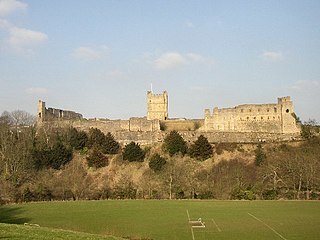 The title has been created four times in English history, and the name refers to Warwick Castle and the town of Warwick. Earl of Huntingdon is a title which has been created several times in the Peerage of England. The medieval title was associated with the ruling house of Scotland. The title Earl of Montgomery was created in the Peerage of England in 1605 for Sir Philip Herbert, younger son of the 2nd Earl of Pembroke. The first Earl inherited the Earldom of Pembroke in 1630 from his brother, the 3rd Earl, and the two titles remain united. Earl of Lincoln is a title that has been created eight times in the Peerage of England, most recently in 1534. The title was borne by the Dukes of Newcastle-under-Lyne from 1768 to 1988, until the dukedom became extinct. Earl of Carnarvon is a title that has been created three times in British history. The current holder is George Herbert, 8th Earl of Carnarvon. The town and county in Wales to which the title refers are now usually spelled Caernarfon. Earl of Powis (Powys) is a title that has been created three times. The first creation came in the Peerage of England in 1674 in favour of William Herbert, 3rd Baron Powis, a descendant of William Herbert, 1st Earl of Pembroke. In 1687, he was further honoured when he was made Marquess of Powis. For more information on this creation of the earldom, which became extinct in 1748, see the latter title. William Herbert, 3rd Earl of Pembroke was an English nobleman, politician, and courtier. He was the son of Henry Herbert, 2nd Earl of Pembroke and his third wife Mary Sidney. Chancellor of the University of Oxford, he founded Pembroke College, Oxford with King James I. He was warden of the Forest of Dean, and constable of St Briavels from 1608 to 1630. He served as Lord Chamberlain from 1615 to 1625. In 1623, the First Folio of William Shakespeare's plays was dedicated to him, together with his brother, Philip Herbert, 1st Earl of Montgomery. William Herbert, 1st Earl of Pembroke KG, known as "Black William", was a Welsh nobleman, politician, and courtier. He was the son of William ap Thomas, founder of Raglan Castle, and Gwladys ferch Dafydd Gam, and grandson of Dafydd Gam, an adherent of King Henry V of England. Susan de Vere, Countess of Montgomery, was an English court office holder. She served as lady-in-waiting to the queen consort of England, Anne of Denmark. She was the youngest daughter of Elizabethan courtier, poet, and playwright Edward de Vere, 17th Earl of Oxford.